I’m not going to lie to you. 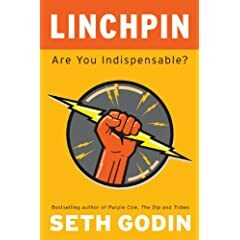 When I received the opportunity to be one of the first to receive Seth Godin’s new book, Linchpin – Are you Indispensable? before it was available to the public, I jumped on the chance. Freakin’ good choice, if I do say so myself. The premise of the book is to help us discover the answer to the question, where does success come from? Not to be left out, the question we never seem to care about, but is always there, where does average come from? is answered to help give us a frame of reference. Don’t be shocked if you recognize the answer. Right from the start, Seth’s assertion is that the choice to be a Linchpin is our choice. It’s not that we can’t be remarkable, it’s that we choose not to be. And it’s not that we came to this choice lightly, it’s that we have had that choice drummed into us through years of school and work, because that was what works for us. Be good at your job, do what you’re told, and everything will be okey-dokey (my word). Because that is no longer true (check your 201k), we may need to reevaluate our choice. This isn’t your typical business or marketing book (not that any of his books are typical). In this case, it’s about focusing on your own value within the organization, and how you have the choice to shape that value. Their are interesting real-world examples, like a company responding to Twitter complaints and finally having a face, and the riff about needing more cowbell. If you’re happy (or satisfied) in your current rut, this book may anger you, or at least make you think you should do more when you don’t want to. This could be another “have to put it down to make notes” book. He doesn’t like one of my favorite phrases, “no fear”. I”m over it. This book is an excellent eye-opener, and if you live on a planet with a bad economy, this book is a must read. Of course, if your the one dude out there who can’t be laid off, outsourced, or reorganized, just get it for the entertainment value.